The following ideas come from The Resource Room. Children enjoy this lesson because they get to help the teacher with it. They repeat simple rhymes whenever Samuel speaks. The rhymes also help them to remember the story. This Printable is available to members. 2. Color in the stars when they can say their Bible verse. 3. Check out their shoe to find their shoe size. 4. Write things that they can do now that they are getting bigger. 5. The teacher can measure their height and write it on the sheet. Children make a book of coats in which every time they open a page the coat gets bigger and bigger. They will enjoy seeing more and more of the background design revealed as Samuel's coats get bigger and bigger each time Hannah comes to visit him. They can also make the same craft used by the teacher in this lesson. Children color the material design pattern and then place a large coat pattern which has the center cut out so that the design shows through the coat. They tape a smaller coat pattern with the inside cut out over the larger pattern. And then tape an even smaller coat pattern over that one. As they lift each coat pattern, the coat gets bigger and bigger revealing more and more of the design below. 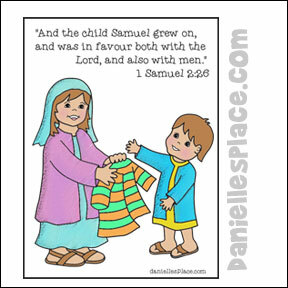 Children love this lesson because they can relate to Samuel and how he learned to do more and more things as he grew. They enjoy sharing with the class what they have learned to do over the past year. When babies are first born they can't do very much. They can cry, and drink a bottle and grab on to things. They can't talk or walk, or even sit up, and they can't even see very well. It isn't long though before they can sit up by themselves. Ask the children what they can do now that they couldn't do when they were a baby. Make a list on the board. Ask them what they know now that they didn't know before and write those on the board. Or let each children share something. Younger children will have fun pretending they are babies again. Tell them to roll over, scoot on their stomachs, get up on their knees, rock back and forth, then crawl, then stand and hold on to things, then walk. Young children will not only enjoy organizing the coats, but will also enjoy seeing all the different patterns and feeling the different textures of the different materials in this activity. Before class print out the patterns and cut them from card board. Then cut the same patterns from patterned paper such as wall paper samples or material. Glue the material or patterned paper to the card board patterns. Glue on buttons and other decorative items if you wish. In class have the children place the coats in order according to size. Starting from the smallest to the biggest. 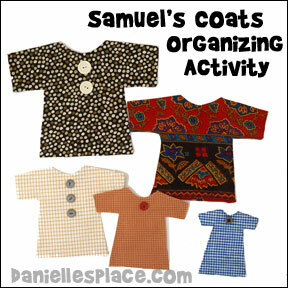 If you have older children, you can play a game to see who can organize them the fastest. Samuel's a boy short and stout. Watch him grow inside and out. Measure the height of each child using yarn. Stretch out the piece of yarn on the floor. Have the children hop, skip, and jump to the other end of the yarn. Save each piece of yarn in an envelope for each child to take home. 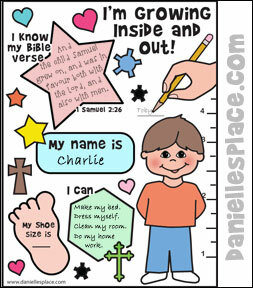 Print on the outside "Measure up like Samuel" and the Bible verse. You may also want to include a note to the parents telling them about what the children learned. Provide a picture or object for each rhyming word below. Place them on the floor in the front of the room. As you recite the rhyme, point to a child to come up and choose the object you are saying. Keep repeating the rhyme until all the children have had a turn to pick up an object. Tape all the baby pictures the children brought in on the wall. Tell all the children the name of one of the children who brought in a baby picture. Have the children look at the pictures and decide which one they think is a picture of that child. Keep going until all the children who brought in pictures are named. Divide the children up into groups with one adult. Separate them so that they can't hear each other. Give each group one minute to see if they can write down the five things that Samuel told Hannah he could do: Open the doors, sweep the floors, say his prayers, clean the stairs, and do his chores. Hannah, Hannah bring me a goat! Hannah, Hannah bring me a boat! Hannah, Hannah bring me some soap! Hannah, Hannah bring me some rope! Bring me Samuel's coat this time. I teach a Sunday school class of 2 to 6 year olds. 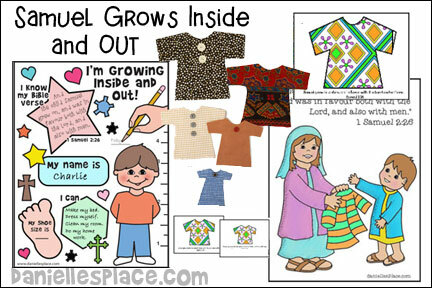 This week I continued in the Samuel series and used the lesson "Samuel Grows Inside And Out". We began the lesson by talking about the things that the children can do now that they could not do when they were babies. The children had lots of suggestions. I made the three coats out of textured wall paper samples, and they got so excited when it came time to see and feel the next coat that Hannah made for Samuel. They also enjoyed saying "Look, Mommy, Look! Look what I can do." The lesson was a little bit longer than what I usually have, but it went well, and the children did like it. The thing that impressed them the most was at the start of the lesson, I measured each child using adding machine tape. I cut them the proper length while the child stood straight against the wall. Then they wrote their names on them and taped them on the wall. After the lesson, I pulled out adding machine tape of the length they were at birth. (I asked their parents last week, but if you don't know, you can just make them all 20" which seemed to be the average in our class.) On these strips I had written, "Baby Courtney." We taped them up next to their other strip of paper. They couldn't believe how much they had grown! I read somewhere that 5 year olds have doubled their birth length and it was true this morning! One little girl, who is very small, was encouraged to see how much she had grown because she is usually the smallest in a group. I think this was a great lesson to kick off our month's theme of "I Grow." Thank you for the great lessons and crafts! 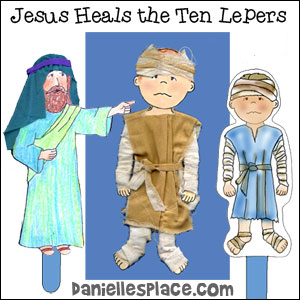 In this lesson children learn how God talked to Samuel; and they learn how God can talk to them today. This lesson includes everything on this page for the "Samuel Listen's to God" Bible Lesson and more. It can be adapted to preschool through 5th grade. Samuel opens and closes his eyes when the child opens and closes his hand! Children can practice saying the Bible verse as the open Samuel's eyes, "Speak, for your servant is listening." 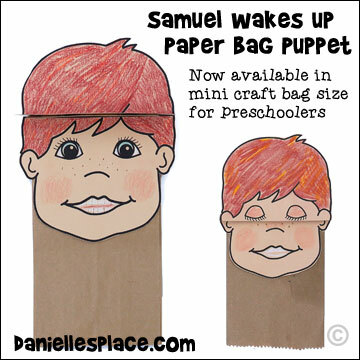 This paper bag puppet comes in two sizes: the regular lunch bag size and mini bags that are great for preschoolers tiny hands. 2. In class have the children color the patterns. 3. Glue the "eyes open" pattern under the fold of the bag. 4. Glue the "eyes closed" pattern to the bottom of the lunch bag so that closed eyes cover the open eyes. You can make these in different ways depending on your children's age and your resources. Permanent Markers, Water-based markers, Dotters, Material Markers, etc. 1. Before class cut the material into 18" x 11" rectangles. Fold the material in half so that you have a 9" x 11" rectangle. Sew the rectangle around the sides leaving a 4" opening on the long side. Turn the pillows right side out and iron them. Iron down the open part so it will be easier for the children to sew. If your children are old enough (first grade or older) prepare some needles with thread so that you won't waste time in class. Use big needles with large holes. My first graders loved this craft. Most of them made more than one pillow. They didn't have any problem sewing them. 2. In class have the children decorate the pillows with markers. I used the water-based markers. Tell your students if their pillows get wet or dirty they can put them in the washing machine, but they will have to draw a new design on them. 3. Show the children how to stuff their pillows by stuffing the corners of the pillows first. 4. When the pillows are stuffed, if your children are old enough, you can have them sew the pillows closed. If they are in kindergarten or younger, you can sew the pillows closed for them with a needle and thread or portable sewing machine or use a glue gun. (Be careful when using a glue gun on material because the glue will come through the material. Place waxed paper on the bottom and top of the material and then press them together. If you don't have a sewing machine a hot melt glue gun can be used instead. The easiest and safest way is to glue the material together with the glue gun set to the low setting. Don't worry if the material doesn't stick together very well. To set the glue place a piece of waxed paper underneath the pillow and on top. Use a hot iron and go over all the seams. Let the glue cool and then peal off the waxed paper. Turn the pillow right side out. (If you have zigzag scissors, you can cut out the rectangle using the scissors, but you will have to cut out all four sides instead of folding the material over.) They will look very pretty finished and you won't have to worry about turning them right side out. Make sure you tell the children's parents that they can wash the pillows in the washing machine, but they can't put them in the dryer. Technique 3 - Use heavy-duty paper towels and a glue gun. These are very easy to make but they aren't as sturdy. 1. Separate the paper towels into squares. Glue one paper towel on top of the other using a glue gun on the low setting. Leave a 4" opening on one side. If you have zigzag scissors cut around the edges. 2. In class have the children decorate the pillows with markers and then carefully stuff them. Use a glue gun on the low setting to glue them closed. I am so enjoying the lessons on Samuel. I teach the 3-5 year old class. We just finished the lesson called "Samuel Listens to God". We started the lesson making the pillow. This was a great hit!! Instead of cutting and measuring the material to fold and stuff, I bought the precut 9" x 12" felt squares, which cost me 9 cents each. I bought the white so that the decorations would show up better. However, you can choose from many colors. Because of their ages, I used my hot-glue gun on three sides before class started. Also, since I have a small class of 5, I wrote with fabric markers their names and the Bible verse as follows: Speak, Lord; for Katelyn heareth. I Samuel 3:10. I left the other side blank for them to decorate with the markers or from a bag of precut felt shapes. They especially enjoyed stuffing their own pillows. To finish off the project, I took the children to a room in which I could darken for the Bible story--this allowed my helper to hot-glue the last side. 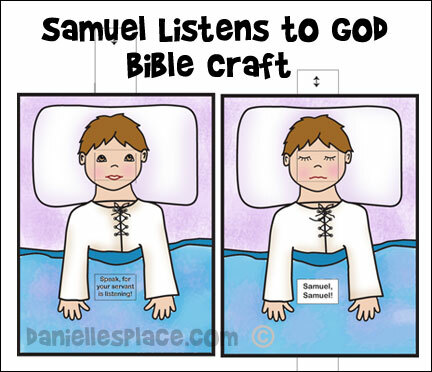 Samuel Wakes Up Craft - "Speak, for Your Servant is Listening"
2. Cut out the faces pattern and tape the tabs to the bottom and top of the patterns where indicated. Use an Exacto knife to cut open the lines on the Samuel in bed pattern. 3. 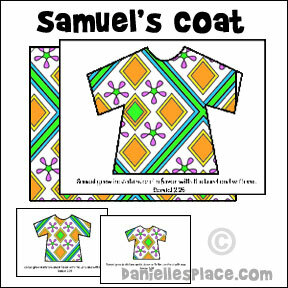 Have the children color the picture and then weave the faces pattern into the Samuel in bed pattern. Start from the back of the Samuel picture. Place the top of the faces pattern through the bottom slit and bring it up through, and then put it back through the next slit, right above the slit you just put it through. Then bring it up through the next slit and back through the next slit and up through the top slit. 4. Show the children how to pull up the tab to reveal Samuel's sleeping face and the words, "Samuel, "Samuel." and then pull the tab up some more to see Samuel waking up and answering God with the words, "Speak, for your servant is listening." 1. Give each child a paper plate and paint stir stick. 2. Have your children write the Bible verse "And Samuel grew, and the Lord was with him, and did let none of his words fall to the ground." 1 Samuel 3:19 on the paper plate and decorate it with the markers. 3. When they are finished decorating the paper plates have them tape a stir stick to the back of their plates. 4. 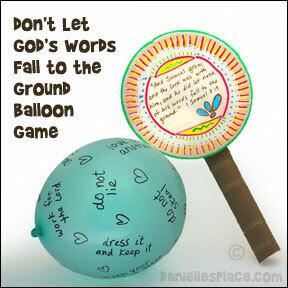 Have your students blow up large balloons and write things on the balloons that God tells us to do. Help your children come up with ideas and write them on the board. 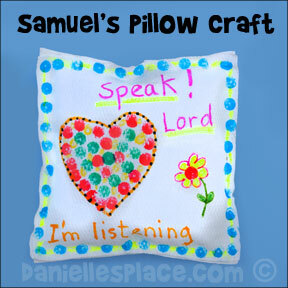 Use this activity to introduce the Bible lesson about Samuel Listening to God. Have all the children lay down and pretend to be Samuel. (They can use the pillows they made in the opening activity.) Tell them to listen carefully. You are going to whisper one of their names. When a child hears his name he should sit up and say, "Speak, for your servant is listening!" and then lay back down again. Before class blow up about five large balloons and write on the balloons with a permanent marker important Bible teaching such as: obey your parents, love one another, do not lie, do not steal, etc. In class have the children stand around the room. Explain to them that the Bible says that Samuel didn't let any of God's words fall to the ground. This means that when God told Samuel to do something, he did it. 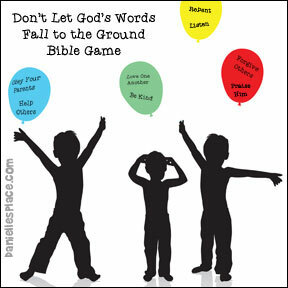 Show them the balloons with the words on them and explain that the balloons have things that God tells us to do from the Bible. Read the words on the balloons and then say, "Let's see if you can keep them from falling on the ground." Tell the children that they can not move from where they are standing. They must keep both feet on the floor as they try to keep "God's words from falling to the ground". Start playing some music and throw up a balloon into the crowd of children. They should try to keep it from falling on the floor by hitting it up into the air. If it touches the floor, they can't pick it up again. Keep throwing up more balloons until all of them are up in the air. Keep playing until all the balloons have fallen on the floor. At the end of the game remind the children that when we listen to God's words and obey them, we are keeping them from falling on the ground. Older children find words in the picture that will fit in the conversation bubble to reveal what Samuel said. I teach a 2 to 6 year old preschool Sunday school class. 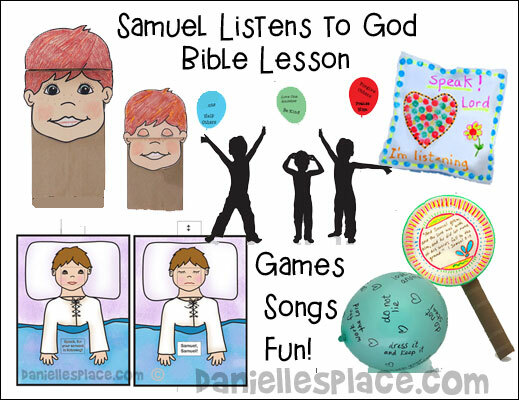 We finished the Samuel series this week by doing the "Samuel Listens To God" lesson. To set the mood, I made a "bed" for us to have our lesson in. I made a soft area out of several blankets and comforters, one on top of another. Then I threw pillows all around the outside of the area for the children to rest on during the lesson. I thought this would be a wonderful attention getter. The children loved it! The lesson went well. I found out that we have some gifted "snorers". 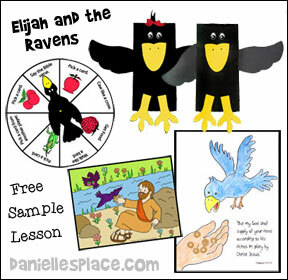 I just used this lesson to teach my Little Church School children (ages 3-5) with helpers up through middle school age. The attendance was less than normal so the older children participated; one played the part of Eli. Since I hadn't taught the lesson about Samuel growing inside and out, I opened with a preface about Hannah and how she longed and prayed for a child, and of her promise to dedicate the child to God should she ever have one. I showed pictures from a children's Bible of her praying with Eli overlooking, Hannah giving Samuel over to Eli when he was about three, and of the wakeful night. The kids' had rapt attention. Then we acted out the story with the kids laying down and snoring, my calling Samuel through a paper towel roll, and the kids getting up and "running" with their feet to wake Eli and saying "Here I am." The kids all said "Speak, for your servant is listening." several times when the time came in the story. Then we talked about what servant means and how we all can be servants of God. The paper towel tube was great for repeating all the things God says to us in the Bible. The most fun part was taking out eight balloons on which my daughter had written different commands from God that we didn't want to have fall to the ground. Be kind, be joyful, love your God, obey your parents, do not steal, do not lie, love one another, be thankful. The older kids helped by reading each balloon as it came to them - all the commands were reinforced in a most delightful way with the wonderful words just bubbling about with the balloons. No one wanted this part to end. Faith Based Rainbow's Promise Kids Rug 5'4" x 7'8"